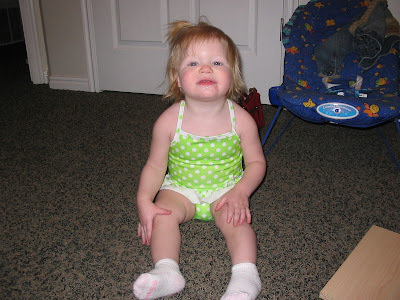 Sadie trying on her new swimming suit. She's such a babe. Obtain a 55-gallon box of LEGOs (or you may substitute roofing tacks). Have a friend spread them all over the house. Put on a blindfold. Try to walk to the bathroom or kitchen. Do not scream because this would wake a child at night. Borrow one or two small animals (goats are best) and take them with you as you shop. Always keep them in sight and pay for anything they eat or damage. Obtain one large, unhappy, live octopus. Stuff the octopus into a small net bag making sure that all the arms stay inside. Obtain a large plastic milk jug. Fill halfway with water. Suspend from the ceiling with a cord. Start the jug swinging. Try to insert spoonfuls of soggy cereal into the mouth of the jug, while pretending to be an airplane. Now dump the contents of the jug on the floor. That about explains it. I like the mess test. It reminded me of my sister's little girl who found a green hot dog under her bed and thought she should take a bite. It about makes my stomach turn a few times. Yucky, as I say to Haley. Sadie is so cute! I tried to bring a small goat to the grocery store to see if I was ready for a kid... um I'm not quite yet. I love it!! All those things are so true. What a kick! This is a perfect post. Any parent has to laugh at the trueness of the tests, and the picture of Sadie explains why it’s all worth it. What a great post! Sadie is a real bathing beauty!